Samorin, Slovakia: With success having eluded him in nine years of riding, Mansour Saeed Al Faresi was probably one of the unlikely candidates to excel in the FEI World Endurance Championships for Young Horses 2014 at Samorin, Slovakia, on Saturday. The advice of His Highness Shaikh Mohammad Bin Rashid Al Maktoum, Vice President and Prime Minister of the UAE and Ruler of Dubai helped him brush aside his past disappointment and claim victory for the UAE on a day that ended in heartache for his teammate Shaikh Hamed Dalmouk Al Maktoum. An array of riders from the UAE, Argentina, France, Estonia, Russia, Spain, Portugal, Hungary, Poland and the Czech Republic will compete in the challenging 120km CEI 4 event for seven-year-old horses. 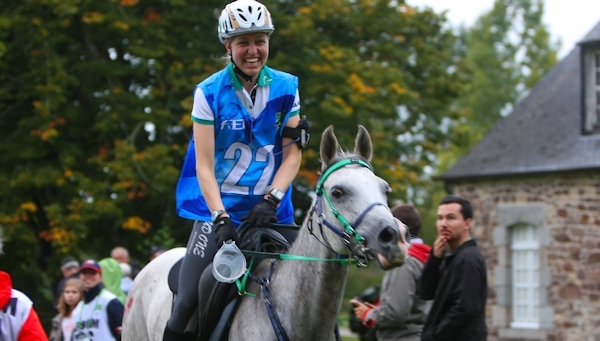 Samorin: The FEI World Endurance Championships for Young Horses 2014 got off to a rousing start as riders from 15 countries came together in pursuit of glory at Samorin, Slovakia. The event opened to the rapturous sound of drumming by a band wearing the green and gold colours of HH Shaikh Mansour bin Zayed Al Nahyan Global Arabian Flat Racing Festival as representatives from the participating countries performed a march past waving their national flags to the crowd. Miloslav Seruga, President of the event was joined by Peter Pellegrini, Minister of Education, Science Research and Sport, Lara Sawaya, Chairman of Ladies Racing Committee in the International Federation of Arabian Horse Racing Authorities (IFAHR) offered an enthusiastic welcome to the riders and wished them best of luck. The FEI Balkan Endurance Championships 2014 took place on 20 September in Meljak in the Barajevo municipality of the Serbian capital Belgrade. Seven National Federations were represented with Croatia stealing the show and scooping two of the three individual medals as well as team gold. The Championship was run over an 80km course made up of four loops consisting of 28km, 20km, 16km and a final 16km. The area of Meljak lies south of the city of Belgrade and is nestled between the two major mountains of the region: the Avala Mountain found to the south east of Belgrade and the Kosmaj Mountain to the south west. The beautiful backdrop of rolling, rural hills provided a technical and testing course for this relatively new FEI Endurance event. 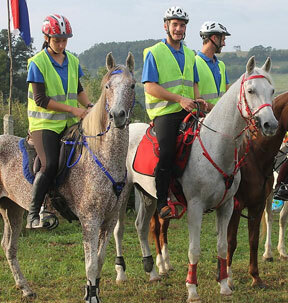 The 2014 FEI Balkan Endurance Championships took place on September 20th in Meljak in the Barajevo municipality of the Serbian capital Belgrade. Seven National Federations were represented with Croatia stealing the show and scooping two of the three individual medals as well as team gold. Bratislava, Slovakia: Female Emirati horse rider Afra Khalifa Al Suwaidi hopes to bolster what has been a fine season by giving a good account of herself in the FEI World Endurance Championship for Young Horses 2014 at Samorin, Slovakia on Saturday. The event is sponsored by the HH Shaikh Mansour Bin Zayed Al Nahyan Global Arabian Horse Flat Racing Festival, in keeping with the strategy to promote equestrian events around the world. A competitive field of 48 riders, including five hopefuls from the UAE, will compete for top honours in the 120km ride for seven-year-old horses. Bratislava — The HH Shaikh Mansour bin Zayed Al Nahyan Global Arabian Horse Flat Racing Festival will cross a new frontier in its worldwide patronage of equestrian sports. It lends its support to the FEI World Endurance Championship for Young Horses 2014 at Samorin, Slovakia, on Saturday, a Press release said. A competitive field of 48 riders, including five hopefuls from the UAE, will compete for top honours in the 120km ride for seven-year-old horses. The UAE challenge is spearheaded by Al Ain’s Afra Khalifa Al Suwaidi, who led the UAE ladies endurance team to a double gold medal winning success in the Her Highness Shaikha Fatima bint Mubarak Ladies Endurance Cup in Verona, Italy, in July. Afra will partner the Hassan Rakhan Al Mansoori-owned gelding Ainhoa Tidjor, a horse which helped her qualify for the Slovakia ride. World Endurance champion trainer Ismail Mohammad has entered a four-strong field of horses with Shaikh Hamed Dalmook Al Maktoum, likely to partner the highly-regarded Normandy. Mansoor Saeed Mohammed Al Faresi will team up with Tiswan Fageole while Mohammed Saeed Mohammed Al Faresi rides Caramel Do Silva. Saeed Mohammed Saeed Al Khayari completes the UAE quintet aboard the UAE-bred gelding Ostro Di Chai. Al Shaqab’s Endurance team celebrates it's victory in the podium at the Florac championship in Monpazier, France last weekend. The Qatar team was its dominating best in the event. Al Shaqab is the name of the moment in endurance world after three weekends in a row wins. Since August, Al Shaqab hasn’t given a chance for other teams to reach the podium and confirmed a successful season in Europe. In an atmosphere perfect for achieving good results, the endurance team went to Florac to participate in three competitions: CEI3 160 Km, CEI3 140 Km Young Horses 8 years and CEI2 130 Km. The team were ready to compete with the best riders and horses from Europe, in a really traditional competition in France. Florac is known for the particular characteristics. It’s very tough track with mountain climbing and downward tracks, making it very hard and difficult race. But Al Shaqab endurance team overcame the challenges and showed it’s qualities, confirming the professionalism in the team. 12 September 2014, Abu Dhabi ~ The sponsorship of International Endurance Championships was the subject of an international news conference at the opening of the Abu Dhabi International Hunting and Equestrian Exhibition (ADIHEX). Now the HH Sheikh Mansoor bin Zayed Al Nahyan Global Arabian Horse Flat Racing Festival has stepped up to sponsor endurance events in the five continents from the upcoming 2015 season. A TOP Bahraini rider has been stripped of his medals by the international governing body for horse-riding sports due to animal abuse. The International Federation for Equestrian Sports (FEI) said on Monday that the winner of His Majesty The King's Cup 120km endurance race in February will have to relinquish his awards. Two British journalists filed a complaint against the winner, Shaikh Mohammed bin Mubarak Al Khalifa, and his groom over an alleged horse-beating incident. It related to online video footage showing the horse, Tarabic Carl, beginning to slow before being beaten by two men who appeared from a nearby pickup truck. 9 September 2014, Caucasus, Russia ~ 125 years ago, here at the foot of the Mt. Zmeyka in the Caucasus, Count Stroganov laid the foundation of Arabian horse breeding in Russia. At the end of August, Tersk hosted its 4th annual festival of Arabian horses, this year celebrating the 125 years of this most important stud. More than 3,000 people attended the 2014 Tersk Open House on August 22 and 23. As part of a two-day event program, Tersk held the Star of Five Mountains National C- class show and Summer Stakes of Tersk. The festivities also included a children’s show-jumping competition, supported by the Ministry of Agriculture of the Russian Federation, and the All-Russian Scientific Research Institute of Horse Breeding (VNIIK), ECAHO and RAHBA (Russian Arabian Horse Breeding Association). A formal protest lodged with the FEI by two British journalists has resulted in the disqualification of the winning rider in last February’s King’s Cup 120km endurance race in Sakhir, Bahrain. The disqualification of Sheikh Mohammed Bin Mubarak Al Khalifa, of Bahrain, was handed down by the FEI Tribunal early today. The February 8 race, a CEI2* event, was at the centre of controversy over online video footage. Horse racing’s world governing body has been lambasted by its own tribunal for failing to adequately punish a wealthy Arab Sheikh whose horse was repeatedly beaten during two international endurance races. According to International Equestrian Federation (FEI) rules, Sheikh Mohammed bin Mubarak Al Khalifa, a member of Bahrain’s royal family, should have been automatically disqualified from winning the King’s Cup in Bahrain in February after his groom ran onto the race track and struck his tiring horse several times in the closing stages of the 80-mile race, The Telegraph reported. The incident was not reviewed by the federation until video footage was unwittingly posted by the event’s own broadcaster, attracting international condemnation. Sheikh Mohammed was given a yellow warning card, fined 500 Swiss francs ($534) and suspended for the few remaining weeks of the Middle East winter horse racing season. A formal protest by two journalists – the Telegraph's Pippa Cuckson and Lucy Higginson, former editor of Horse & Hound – over a horse-beating incident during an endurance race has resulted in a ground-breaking ruling against the sport’s governing body by one of its own tribunals. It found that judges from the International Equestrian Federation failed correctly to disqualify rider Sheikh Mohammed bin Mubarak Al Khalifa from winning the prestigious King’s Cup in Bahrain in February, when his groom ran onto the “field of play” and struck his tiring horse several times in the closing stages of the 80-mile leg of a desert ride. It also dismissed the FEI’s claim that under “double jeopardy” an earlier punishment against the rider could not be reassessed. Morgan Skillen, a Year 11 student at Antrim Grammar School and member of Mid Antrim Pony Club has won first place at the Pony Club UK Championships at Cholmonodeley Castle, Cheshire in Endurance Riding. Morgan qualified at the St Patricks Coast Ride in April this year and since then she has been training daily and attending Endurance Events in order to maintain her own stamina and her pony Mayo’s fitness. After all the blood, sweat, tears and dedicated relentless training it all came together at the Championships and gave Morgan her first win in this discipline. Mayo was none the worse for wear after a 10-hour journey and, following a full day’s rest, he passed his Vet tests with flying colours and they both took off. After a second week of top-flight sport and a final weekend boasting exceptional crowds in Caen, the 7th edition of the World Equestrian Games drew to a close in a festive, Olympic village atmosphere. Over 565,000 spectators attended the Games, which the International Equestrian Federation (FEI) confirms is a biggest audience since the creation of the event in 1990. A record number of 1,750 journalists from some 52 countries were accredited for the Games, testifying to the global appeal of this major equestrian sport meeting. This augurs well for the next edition in 2018, as the FEI hands on the torch to Canada during this evening’s closing ceremony. For the Normandie 2014 Organising Committee, their mission is virtually complete. The past two weeks have seen moments of great satisfaction and fantastic surprises, as well as difficulties overcome and a few moments of sadness. A full evaluation of the Games will be made in th coming weeks to measure its impact on the region. The first elements (notably the hotel occupancy ratio and consumption by spectators, half of whom were French) show that the public has been out in force at the Normandy meeting, continuing the momentum initiated by the 70th anniversary of the Normandy landings, and have also followed the event on television around the world. HRH Princess Haya, President of the FEI, “Its incredible success on the social networks made these World Equestrian Games the most connected in history. It was also the loudest (laughs): the athletes all say that they’ve never received so much applause and support”. It is one of the major aims of any sporting event, to ensure the athletes have the best possible conditions with which to fully express themselves in their performances. In Normandy, across 7 different and largely unique venues, some 27 titles have crowned the top riders in 8 world championships. Their comments and their feedback for the delegation officials have been positive, as much in terms of the welcome (horses and teams), as the organisation of the competitions and the atmosphere in the stadiums. The proximity to the public, which has been a priority since the initial preparation of the events by the Organising Committee, has brought the multitude of sporting highlights to life. Spectators delighted in the achievements of the top riders from their ringside seats in venues fitted out especially for the event with giant screens and spirited commentary. Over 200,000 people have graced the Games Village, some coming along to continue their emotionally-charged day of sport, others simply wishing to benefit from the ‘Olympic’ atmosphere or the Alltech Music Festival concerts. The opening ceremony itself, a sensitive creation and a genuine work of art, which won public acclaim, played to a full house (21,000 spectators). Enjoying the close-knit relationship, which has always existed, men and women and their horses, spectators, athletes and organisers have come together to open and close the page of the Games’ story in Normandy. Dubai: Emotions ran high as the curtain came down on the 2014 Alltech FEI World Equestrian Games bringing to an end two weeks of unparalleled horse-riding at the historic city of Normandy, France. Besides the breath-taking action, the seventh edition of the Games which were launched in 1990 in Stockholm, Sweden, will be best remembered for establishing several records not least the highest participation and attendance. Horsemen representing a record 74 nations, an increase of 25 per cent on the last Games in 2010, were watched by over 570,000 spectators while the FEI’s YouTube Channel exceeded over 5.5 million views during the Games. FEI President HRH Princess Haya was today made Officer of the National Order of the Legion of Honour, France’s highest distinction. Laurent Fabius, French Minister of Foreign Affairs and International Development, presented HRH Princess Haya with the Legion of Honour insignia in the Prefecture of Caen (FRA), the main host city of the Alltech FEI World Equestrian Games™ 2014. Addressing international media and over 100 guests at the special ceremony in the magnificent setting of the Gold Salon (Salon doré), he cited HRH Princess Haya’s career as an Olympic athlete, her contribution to equestrian sport as FEI President and her success in bringing the Alltech FEI World Equestrian Games™ 2014 to Normandy. He also charted HRH Princess Haya’s extensive and well-documented humanitarian efforts in some of the harshest parts of the world. “I accept this honour on behalf of all of my colleagues at the Fédération Equestre Internationale and everyone who contributed to the success of the World Equestrian Games in Normandy, including the 3,000 French volunteers and the wonderful people of this region, who welcomed the equestrian world to their home,” Princess Haya said in her acceptance speech. “I accept this honour on behalf of the dedicated humanitarian aid workers that I encounter in my travels as a UN Messenger of Peace - the selfless healthcare workers from Médecins Sans Frontières, the humanitarians from the World Food Programme, and so many other committed people who serve those in need long after I have returned to the comforts of my home. “I accept this honour knowing that I have done so little to earn it, but inspired to do more in my limited capacity to advocate for a more equitable, more compassionate and a more peaceful future. I am deeply grateful,” she concluded. Princess Haya follows in the footsteps of her late father, HM King Hussein I, who accepted the Grand Cross of the Legion of Honour in 1967. Since its creation in 1802 by then-First Consul and later Emperor of the French Napoleon Bonaparte, the Legion of Honour has been awarded to historic personalities such as the Italian composer Giuseppe Verdi; Mustafa Kemal Atatürk, founder of modern Turkey; Dwight D. Eisenhower, 34th President of the United States and Supreme Commander of the Allied forces in Europe during World War II; Queen Elizabeth II; former Polish President Lech Wałęsa; and Akihito, the reigning Emperor of Japan. The list of prestigious recipients also includes American animator, producer, director, screenwriter, and philanthropist Walt Disney; one of the greatest writers of the 20th century Graham Greene; Belgian Eddy Merckx, one of the best cyclists of all time; Italian philosopher and novelist Umberto Eco; Canadian singer Céline Dion; French mountaineer and Minister of Sport Maurice Herzog, an IOC member until his death in 2012; and American musician, singer-songwriter, artist, and writer Bob Dylan. Former FEI Presidents HRH Prince Philip and HRH Prince Bernhard both held the Grand Cross of the Legion of Honour. Following the Open Letter to Endurance by French veterinarians, Doctors Pelissier, Seguin, Benamou-Smith, Romantzoff, and Leclerc, concerning high speeds, "tired over-run horses in the vetgates", high number of treatments required, attempts to "cheat systematically" by some competitors, and in particular the death of one mare at the May 2014 Compiegne endurance races, this group of veterinarians has responded to the FEI's investigation into the horse's death. Of the mare Elmerita di Gallura's death FEI concluded, "results from the anti-doping test are negative and the post-mortem examination did not explain the cause of death." Veterinarians Benamou-Smith, Pelissier, Romantzoff, and Sequin express strong objection to this apparent dismissal of the incident, and do not accept that the FEI, "whose self-professed mission is to lead an enquiry into the death of a competing horse, produces such a statement. In order to show a real transparency (the key factor in 'clean sport') in ethics and sports, the complete scientific results of these tests, which are known to the FEI since June, should to [sic] be published." The veterinarians can't help but draw a parallel to another horse in the 2012 Florac race, which "died in very strange clinical circumstances. The horse was sampled post-mortem at the venue. No less than 21 controlled substances were identified by the french MCP (medication control program) laboratory LCH." However, the veterinarians are still waiting for the FEI to release the results of these samples from 2 years ago. Another mare from the same stables as Elmerita di Gallura was also treated at the May Compiegne ride and received invasive treatment because she was metabolically compromised. In such cases, FEI has instituted mandatory rest periods for the safety and well-being of the horses; and in this case, the mare was entered to race in Italy 17 days later, without being blocked by FEI, "which defies official mandatory rest periods and common sense." While FEI has publicly expressed their intention and campaign to fight doping, and to have a "clean sport," these incidences continue to show the great distance between expressed intent and execution, and the reputation of the sport of endurance suffers while the horses continue to pay the price. The French veterinarians insist that the FEI live up to their "transparency" goals. "Although the intention expressed by the FEI to fight doping has never seemed stronger, we still have the feeling that actions are not yet sufficient to attain the declared objectives." PETALING JAYA: A Malaysian teenager has made his mark as one of the world’s top riders at the Alltech FEI World Equestrian Games 2014, dubbed as the planet’s most prestigious international equestrian event. Mohd T. Aseef Abdul Mutalib, 17, who is the youngest competitor among riders from 72 nations, successfully completed the Endurance category where he clinched 27th position in the Games held in Normandy, France. The Games, which began on Aug 23 and ends today, attracted almost 1,000 of the world’s best riders and unite the world championships of seven disciplines governed by the International Equestrian Fede­ration (FEI) – Jumping, Dressage and Para-Equestrian Dressage, Eventing, Driving, Endurance, Vaulting and Reining. I consider myself very lucky to have had the opportunity to go to the World Equestrian Games, which are taking place in the scenic city of Normandy, France. I would say it was a once in a lifetime kind of experience for me. Most of my career I’ve been covering the flat — Derby’s, Breeders’ Cups, Arcs — that sort of thing, but this experience was so different. The World Equestrian Games are all encompassing. It gives you a totally different kind of buzz. Although I do not wish to sound clichéd, I think that they totally deserve to be referred to as the ‘horse’ Olympics. The time that I spent watching the dressage, eventing, vaulting or endurance riding, put a lot into perspective for me in the way that I was already looking forward to my next equestrian event. Qalao de Mers, ridden by Frenchman Maxime Livio has tested positive for a banned medical substance in Normandy and could miss out on Rio 2016 ©AFP/Getty ImagesThe French eventing team faces the prospect of being thrown out of the Rio 2016 Olympic Games after Qalao de Mers, ridden by Maxime Livio, tested positive for a banned medical substance at the World Equestrian Games in Normandy. The International Equestrian Federation (FEI) has confirmed the horse, part of the French team that finished fourth in the team eventing competition ensuring qualification for Rio 2016, tested positive for the controlled medication substance acepromazine, banned during competition. The sedative was found after a sample was taken from Qalao de Mers last Friday (August 29), who also partnered Livio to fifth in the individual competition. The case is now set to go before an FEI Tribunal - on a date yet to be announced - but if found guilty then the French team and Maxime Livio will be disqualified from the World Equestrian Games and will also be banned from competing at Rio 2016. The FEI also revealed a second horse tested positive for a prohibited medical substance on August 28. The FEI has announced that two horses competing at the FEI World Equestrian Games have tested positive for Controlled Medication substances. Controlled Medications are substances that are regularly used to treat horses but which are not allowed in competition in order to maintain a level playing field. All equine samples taken prior to and during the Games are tested at the FEI Approved Laboratory in Paris (FRA). Testing is conducted at the Laboratory using a bar-coded system, which guarantees anonymity. A high-level observer programme for organisers of future key equestrian events is being carried out for the first time at the Alltech FEI World Equestrian Games™ 2014 in Normandy (FRA). Teams from the Rio 2016 Organising Committee for the Olympic and Paralympic Games and the FEI World Equestrian Games™ 2018 in Bromont (CAN) are currently in Normandy to experience and get a detailed understanding of the complex organisational requirements of top-level equestrian events. Paul Coté, President of the Bromont Organising Committee COJEM2018, Roger Deslauriers, general manager of the Bromont Equestrian Park, and the Mayor of Bromont Pauline Quinlan are the key members of the Canadian delegation attending the Games in France. They will remain at the Alltech FEI World Equestrian Games™ until the end of the event and will be involved in the handover ceremony that brings the Games to a close this Sunday. Impressive Brazilian delegations are also in attendance at the Games in Normandy. The members of the Rio 2016 Organising Committee for the Olympic and Paralympic Games were joined by seven representatives of the Ministry of Sport, the universities in charge of the preparation of the Eventing cross country course, as well as the architects responsible for the development of the equestrian venue, which is part of the Deodoro cluster in Rio. “The FEI Observer Programme provides a valuable opportunity for the organisers of the Rio 2016 Olympic and Paralympic Games and the FEI World Equestrian Games 2018 in Bromont to witness first-hand an equestrian event of this magnitude,” Tim Hadaway, FEI Director, Games and Championships, said. “The delegations have visited all the competition venues here in Normandy, as well as back-of-house locations including stabling, training areas, and veterinary facilities. This process has helped them understand the standards expected by National Olympic Committees and National Federations at equestrian events at the very highest level. COJEM2018 President Paul Coté applauded the FEI Observer Programme initiative. "The organising committee of the FEI World Equestrian Games 2018 in Bromont really welcomes this process set up by the FEI,” he commented. “It is a great opportunity for us to learn from the experience of the previous Games organisers, and the close cooperation with the FEI on location will help us launch our activities in partnership with them." The 34th annual Shahzada, "the ultimate test in horsemanship" was run August 25-29 in historic St Albans, New South Wales, Australia. The ultimate test is held over 400 km over 5 days, and you get a completion and placing only if you finish all 5 days. This year there were 57 entries; 27 completed all 5 days. First place was Ian Curtis and Blakes Heaven Summer Wind in a total time of 35:02 for the 5 days. Second was Narelle Childs and Halo Kazaam in 35:56. Four juniors completed the marathon, with Josephine Jansen and Windaroo Devina Glamour finishing 4th. Fifteenth place Karen Rhodes received her 19th Shahzada buckle. Sixteenth placed Marg Boland and Rosebrae Cameo won the Best Managed Award. Riders had to deal with occasional showers, and heavy overnight rain for the second day. "The already tough terrain became almost impossible when rain made the course and river crossing nearly impassable," the Shahzada website reported. Some of the course had to be re-routed for the horses' and riders' safety. 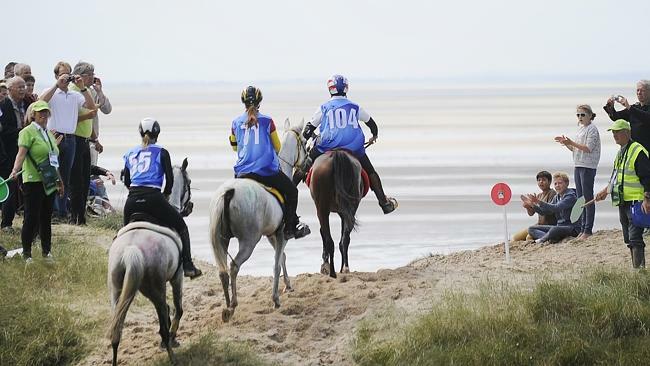 Sartilly, France - On Thursday morning, 165 horse-and-rider combinations set out on the 2014 Alltech FEI World Equestrian Games endurance course. Covering stretches of sandy beaches, wooded trails, and town streets, Jeremy Olson (La Motte, Iowa), riding his and Amy Wallace-Whelan's Wallace Hill Shade, were one of only 38 combinations to complete the trying course. Rain throughout the week created difficult footing, leaving teams to strategize how best to handle the 160 km trail. Coming through the first vet gate, Olson was in 51st place. He took the course steadily throughout the day, a strategy which allowed him to climb the ranks by the end, finishing in 31st place with a time of 10:46:16. Riding his entire life, Olson grew up around the sport of endurance with both his parents and sister being active competitors. Olson was placed on the team as an alternate; however, after teammate Meg Sleeper decided it would be in the best interest of her mount, Syrocco Reveille, to be withdrawn from competition, Olson was ready to make his World Equestrian Games debut. Coming into the Championship, Olson had a second-place finish in the Broxton Bridge Fundraiser CEI3* riding Wallace Hill Shade. He then scored a win in the CEI1* at the Zone Team Endurance Challenge with Noslo's RRenaldo. Fellow U.S. Endurance combinations were unable to overcome the challenges Thursday would pose, as they were withdrawn at vet gates throughout the day, ensuring the horse's welfare was held as the utmost priority. Spain was victorious in the Team Championship to take home the Gold medal with a total combined time of 28:56:02. France claimed the team Silver medal and Switzerland earned the Bronze medal. The Individual Gold medal was awarded to Sheik Hamdan bin Mohamed Al Maktoum, who rode his mare, Yamamah, in a total time of 8:08:28. Marijke Visser and Laiza de Jalima earned the Silver medal, and Bronze went to Abdulrahman Saad A.S.Al Sulaiteen riding Koheilan Kincso. The course was tough and dangerous in some places. All riders, even the ones achieving a good placing, were unanimous - of course, the riders eliminated are often tending to complaining about this and that. Portions very technical during the first stage (this with of courses fresh and sometimes excited horses, sometimes ridden by inexperienced riders), swamps during the second stage (this definition was used by JF Francès, the French rider completed 8th), very wet and knee-deep muddy places and of course lots of lost shoes. But... but... there were many and repeated requests during the chef d’equipe meetings to reduce the minimal speed back to a more decent value. In the beginning (in the schedule) it was said that EACH VETGATE had a closing time (calculate on 15 km/h). During the last meeting, they accepted (after a lot of pressure) to enforce ONLY after the 3rd vetgate this minimal speed. Already better as smart riders could better cope with that on a 100km distance than at each loop - the first stage was the most difficult!!! Seing the outcome of the race and considering the tactic adopted by the various countries, it was very clear that the ‘small’ nations were frightened by this minimal speed at 15 km/h. Many went too fast, took too many risks during the initial stage. The horses were fresh, of course, and at this stage the effects on the metabolic do not show… that come later, for some already after the second loop, and for many many others after the third loop. But if, let’s say, it was announced FROM THE BEGINNING, that the speed was 13 km/h, these riders would have managed differently. They would have slowed down in the mud, recollected their horses when approaching the turns, reduced the pace. Maybe they wouldn’t have completed the 160 km, but this slaughter during 2nd and 3rd vetgate wouldn’t have taken place. Alas ! It’s only after the second loop that the minimal speed has been reviewed, back to 14 km/h. It was too late, the damage was already done. Was had been taken from the horses’s reserves couldn’t be refueled. Of course, we do not have the same tactic as we plan to race at 13 km/h in place of 15 km/h. This was not understood by either the president of jury or the technical delegate (when was the last time they rode in endurance…). The riders who rushed at the start and cruised in the lead wouldn’t have changed anything, that’s for sure. But others, the riders who came to get an honorable completion! Impossible for a chef d’equipe or any rider to guess at what speed to ride, the stats from last year were not applicable. The worst in that : the organizers, the chef de piste, the technical delegate have seen the course the day before. They normally knew about the hazards, the possible effects of the humid weather, etc. Because we know that Normandy and rain are good friends. We know about the rain in Belgium too and therefore we take this parameter into account when drawing a circuit. The reality became obvious to the riders only in the morning, when they discovered the trail. Many were already worried when practicing the days before on the white loop, the training track of 10km. Already after the second loop, there were many eliminations. And the biggest contingent felt after the third one. Most of the eliminations were due to metabolic reasons and this has never been seen before! The French team was smart enough and patient. They didn’t run into panic while many competitors were ahead of them. They did well in the rough terrain, they are good riders, they ride good horses, they were cautious in the difficult portions. Perfection. Spain made full profit of its two jackrabbits , Punti and Arboix completing 5th and 6th after a perfect race. The third nation was Switzerland taking advantage of the outstanding result (4th place) of Barbara Lissarague who has the double nationality French/Swiss. The two other Swiss riders rode all the time at 15 km/h to clinch the bronze. Of course, they were lucky that every other nation broke, but don’t you need luck in order to win? United States was claiming for victory, well this is was could be read in the press before the competition. They went back, tail between the legs. They went too fast. Belgium was presented as a good pretender for a team medal. But they lost a first rider at the second vetgate, then two and their illusions at the same time at the third vetgate. There were no other nation except the three on the podium able to classify one team, which speaks for itself. So what will remain from this WEG ? The nice footage broadcasted by Dubai TV, the victory of SH Hamdam and the second place of Marijke Visser on a borrowed UAE horse (is that a sign of the times), the death of the Costa Rica’s horse. ALEXANDRA Toft, one of the youngest riders in the World Equestrian Games endurance ride, was one of only 38 riders from more than 170 starters to finish the challenging 160km event. Only three countries finished the event with a full team. Toft, a member of Australia’s first all-female WEG Australian endurance team, finished 19th with a time of 10:11:23. She had better fortunes than her mother and fellow team member, Penny Toft, who retired early after her stirrup leather broke. Penny was unable to get immediate help and the setback left her 15km behind the field so she retired.